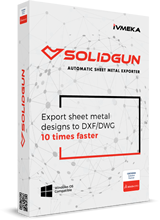 SOLIDGUN detects each sheet metal in design and performs a batch-export operation to DWG/DXF. It accelerates the progress from design to manufacturing. 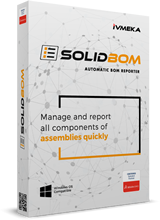 You can easily get the BOM report with SOLIDBOM includes real previews of components. It calculate and obtain the details about the assemblies what you need. IVMEKA develops professional software solutions for SOLIDWORKS customers as a Certified Solution Partner. and download the product demos. July, 2017 SOLIDGUN 2017 has been added "multiple product addition" feature with new incoming update. June, 2017 We have opened up our new support system to solve the problems of our users in the best way possible. June, 2017 Updated SOLIDWORKS 2017 compatible versions for SOLIDGUN and SOLIDBOM. May, 2017 İVMEKA is growing. The number of businesses using SOLIDBOM increased by 43% compared to May of last year. April, 2017 We expanded our field of work in ARI3 Technopark from Turkey's technology bases. March, 2017 Work has been speeded up so that SOLIDBOM can work integrated with ERP / Accounting programs.